Sunnies: Ray Ban | Necklace: Express (option) | Bag: Express (current version here) | Top: JCrew | Skirt: ASTR (option here and here) | Booties: Vince Camuto "Kathleen"
Rachelle was kind enough to remind me that I have a couple of faux leather minis in my closet that need to be worn! They used to fit a bit snug, so I was excited to pull them out and be able to wear them and breathe at the same time. Breathing is always nice when you're in clothes, eh? She styled hers with a plain white tee and the most amazing booties. I decided to pull together some blogger cliche pieces and create a sweet + edgy look. When I say I pulled out some blogger cliche pieces, I didn't mean that I did it so I could properly play the part of a blogger. I just meant that plaid plus pearls plus leopard seems to be pretty popular in the blogger world. Print mixing in general is pretty blogger-ish. But, sometimes I don't need to reinvent the wheel. I do love the way plaid and leopard pair together and the skater skirt takes the plaid from schoolgirl to sassy pretty quickly. I tried on about 4 different pairs of booties with this outfit, but these cut out booties just couldn't be beat! The weather was in the upper 60s this weekend, so I was able to go bare legged for one last time. I have a feeling the cold is going to hit us and stick around before we know it, so I couldn't resist letting my freshly pedicured piggies hang out and give my legs some last bit of sun. Especially before the "fall back" time change when it will feel dark for an eternity now. WAH! 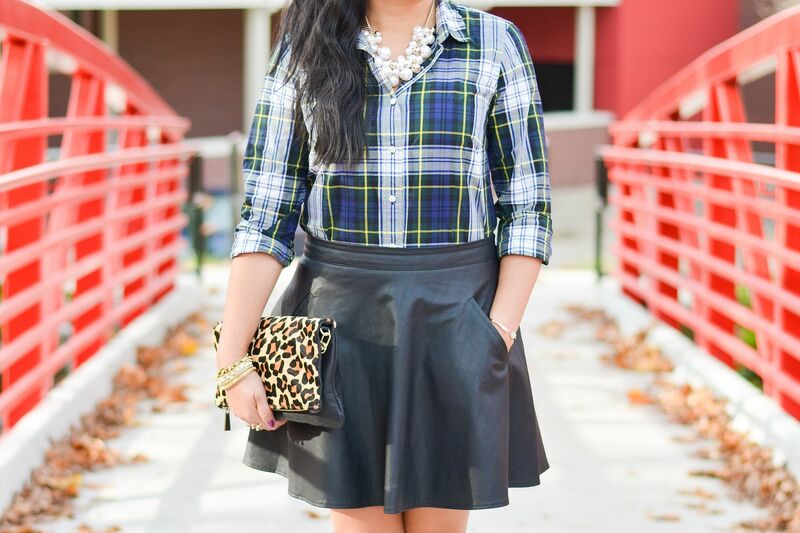 Love that you paired plaid + leather together! Loving this look! The leather and plaid look amazing together and those cut out booties are fabulous! I think I need to pull out my leather skirt too now!